I had two rows of extensions, about 50 individual bonds, for thickness and volume. Application took about two hours from start to finish (this includes a hair wash, application, blow dry, having the extensions cut and blended into your natural hair and then styled!) and was completely painless. I spent the time just chatting all things beauty, blogging and hair with Louise who is so friendly and down-to-earth so the time flew by. We both agreed that the celebrity-style of all-one-length, stringy, arse length extensions looks cheap, tacky and quite frankly just plain bad. 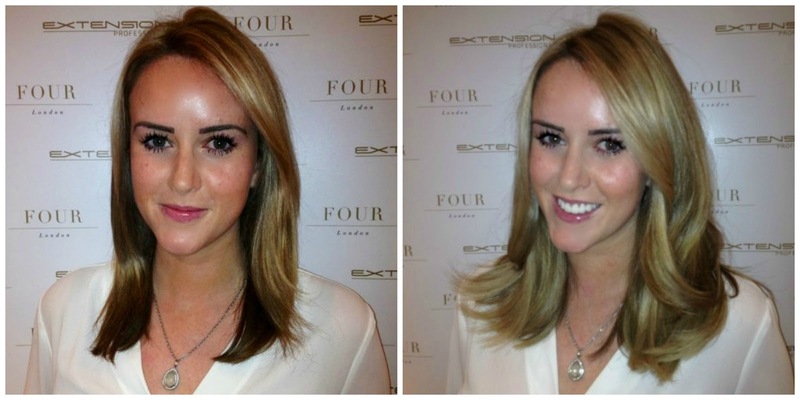 Extensions shouldn't look like extensions and that is the aim for Louise with all of her clients - you would never guess they had hair extensions and that is the whole ethos of Louise and Extension Professional. Louise is an absolute perfectionist and the amount of time, effort and energy (and skill and talent) put into achieving the best possible results for me (and all her clients) was so refreshing and it's obvious she loves what she does. Louise painstakingly trimmed and checked every single section of my hair once the extensions were applied, to ensure a completely flawless result that both she and I were happy with and it definitely paid off (just look at my face in the after pictures - look at that GRIN - I was a very happy bunny!). The Extension Professional system uses Ultra Sonic technology. The pincer (the device used to apply each bond) is cool to the touch and uses only just enough heat to activate the keratin, so there's none of that horrendous smoking, burning smell you get with older, outdated systems and unlike other systems which actually mix the bond into the hair (eep! ), the extension professional keratin bonds only sticks to itself, the pincer allows the keratin to be manipulated around the hair, forming the unique Extension Professional sleeve for the natural hair to fit meaning no damage to the natural hair. Louise pointed out that she has an incredibly loyal client base (the sign of a good extensionist is when the clients keep coming back) and the only time she loses a client is when their natural hair has become so healthy that they no longer need hair extensions! The hair used for the extensions is Indian temple hair and is unbelievably soft and tangle free and the bonds are completely undetectable in my hair (my mum spent a good ten minutes last night examining my hair from every angle imaginable and just repeating 'You'd just never know...... you'd never, ever know! You really cannot tell! They look amazing - you would just never, ever know!). 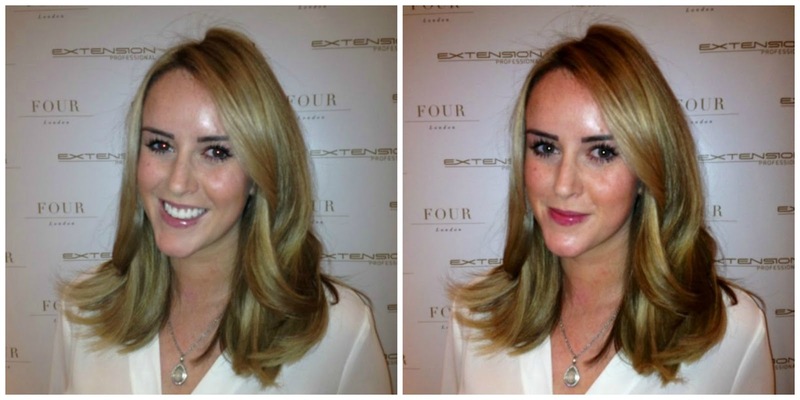 Extension Professional Volume Pro Extensions start from £550 (*) and for length can vary in price (around £800-£1000) and last between ten and twelve weeks..For more information check out Extensional Professional online or call FOUR London on 0207 279 9600 to arrange a consultation with Louise and a quote. Louise bailey is definitey London's hair extension guru and Extension Professional is now offering accredited hair extensions training courses. Louise is incredibly protective of her brand and wants to maintain and continue the first rate reputation so she ensures that only professional hair dressers can train on her intensive course and only the very best will pass it - so you know that anyone offering Extension Professional extensions really knows what they are doing and are guaranteed amazing hair.